Haftar's forces ordered to advance on western Libya to "free it from terrorists"
This move comes despite the latest agreement between Haftar and the west-based Head of Presidential Council, Fayez Al-Sirraj, not to resort to military escalation while working on ending the transitional phase by dialogue. 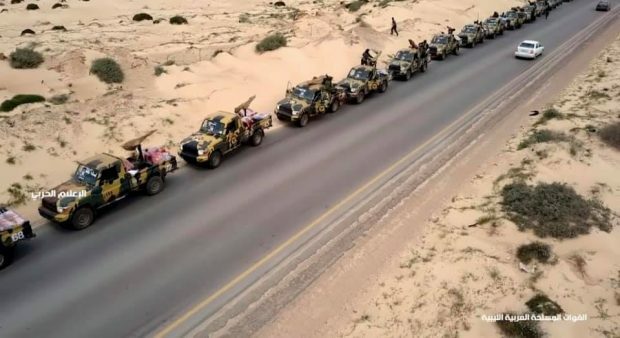 A video released by the media offfice of Haftar’s forces showed a convoy of armoured vehicles and pickup trucks mounted with heavy guns on the road. The convoy appeared to be coming from Benghazi and heading all the way westward. Sirte is in central Libya and is controlled by a force from the western city of Misrata allied to the Tripoli-based Presidential Council; it has warned many times that of Haftar’s forces were to attack the region, they would hit them with an iron fist. A looming war is in the horizon in Libya’s western region amid UN efforts to bring all the parties to the National Conference in just about 10 days.